I have a quilt design in my head which involves circles. Lots of them, overlapping all over the quilt in many colors. 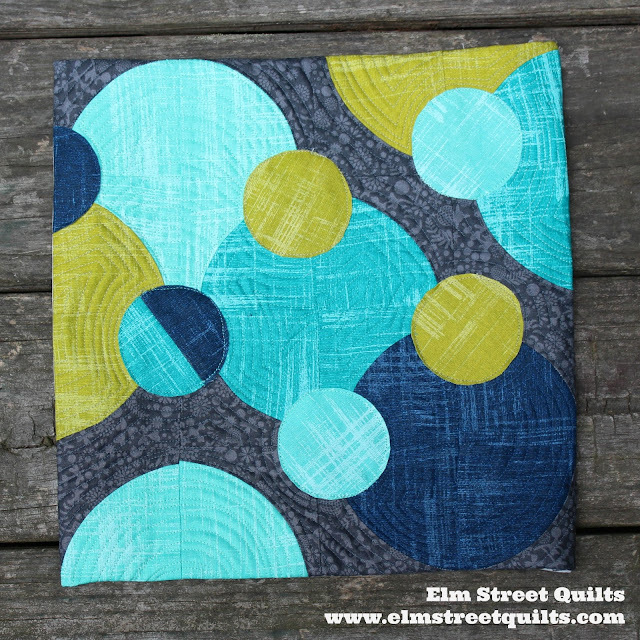 But before I tackled the project, I decide to make a smaller version to test out both my hand drawn templates as well as my true interest in creating a quilt with circles. This mini finishes at 12'' square and used up scraps I had leftover from other projects. The larger circles are pieced and the smaller ones are raw edge applique. The last curved piecing project I did ended up with much bulk in the intersections so I redrew the template to reduce this bulk. This new template solved that problem but didn't actually give me the look I wanted. So back to the drawing board I go. But I still have this wonderful mini with fabrics I really enjoy. While I was enjoying all the wonderful quilts on display at QuiltCon, I saw many hanging without a binding - something I had not seen before. My Experimental Circles mini was a perfect one to try the technique out on since a binding would end up chopping off parts of the circle. This way, the circle just flows off the edge. I found this post and this one to be helpful in learning how to face a quilt. I fudged my way through the corners and found this video afterwards on handling the corners afterwards which would have been quite useful. Now I need to attach a hanging sleeve so I can put it on the wall. I'll be linking up my mini with Freemotion by the River, WIP Wednesday's, Let's Bee Social, Midweek Makers. Needle and Thread Thursdays, Finish it Up Friday and Finished or Not Friday. Very attractive. Pieced circles is new to me. I have been doing mine with Lori Holt's method of facing circles, or any shape, with light weight interfacing and then turning them inside out. I liked your circle that combined two colours. Love the combination of techniques to best suit the problem at hand. I have a feeling - readers will be asking for a tutorial :-) Looks fabulous. That is a great mini. A larger quilt would be even greater! I love the colors you used! I have a circle quilt in my head and someday I'll be productive like you and get it made. Yours is beautiful! Love your circles. I've not been brave enough to do circles. I like the overlapping look. Love them! Are they made with Grunge? And it seems we're working in the same color families this week - love it! Thanks for sharing! Those colors are great together. I haven't done circles in a long while. I might need to revisit them! Lots of fun color and texture. Looks like a successful experiment. Excellent design, I love the overlapping circles and the colors you used. Fabulous! I specially love the way you quilting it! Just love the colors and circles together!